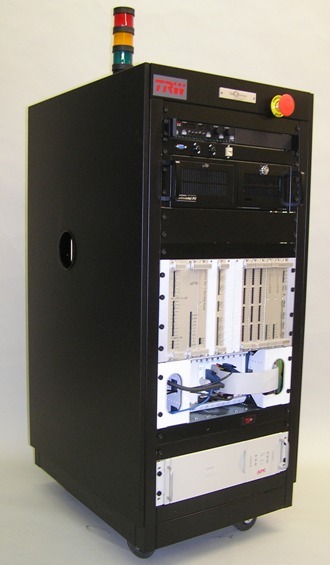 Custom designed, low profile NI PXI test console, including custom backplane, card cage, and custom test cards. Custom designed low-profile PXI test platform based on National Instruments (NI) test platform. The platform is designed with integrated industrial PC, programmable Agilent power supplies, APC UPS, and integrated keyboard, mouse, and including external monitor. The platform design includes custom-designed backplane which interfaces other custom-designed PCAs to NI chassis. Custom PCAs are application-specific designs and include schematic capture, PCB layout, PIC programming, and fabrication. We have built in excess of 100 pieces of this unit in the past 5 years. Ball Systems is the sole source provider to this unit to our customer, and we ship units to customer locations worldwide. Ball Systems also provides full, turnkey documentation management, and also servers as a central repair depot for system sub-assemblies. Worldwide facilities contact Ball Systems to order from a pre-negotiated “pick-list” to configure their unit.